Fajita's... the hub's favorite meal... so we make these often and try and put a new spin on them every time! There are so many different healthy varieties you can create with this meal. Some of our favorite lean protein options are chicken, shrimp, tilapia, and steak! We also love to mix it up with toppings including both unique salsas and purees. Calories can really add up with some fajitas though if you're packing on the sour cream and cheese, so stick with us and we'll keep those waistlines in check! 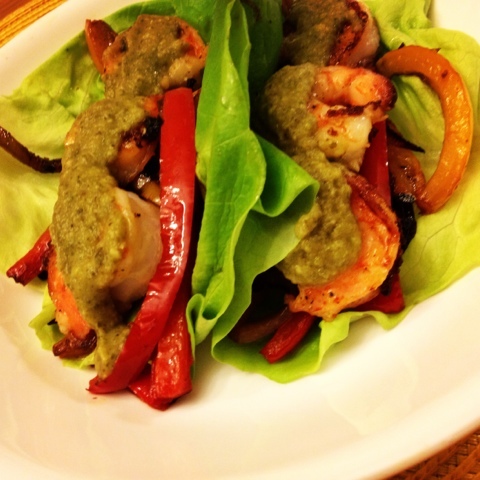 Tonight we are making shrimp fajitas with a roasted poblano puree! We're also going low-carb tonight by wrapping this meal in a cool and crunchy lettuce wrap :) This is a super healthy meal, where you can eat not only one, but two, wraps for only 311 calories! We start off by making our poblano puree. Simply pop two roasted poblanos, garlic, fresh cilantro, chicken stock, lime juice and one avocado into your food processor and blend away! 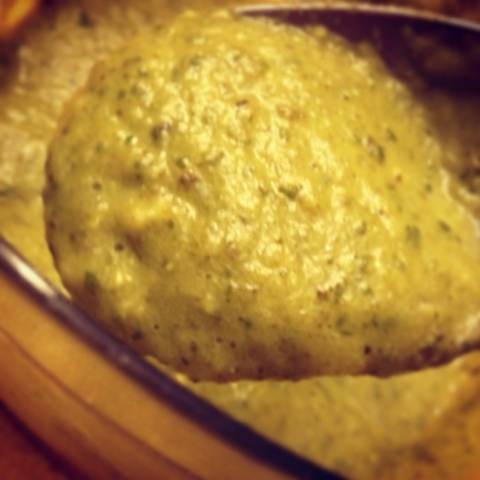 The avocado gives the puree a nice and creamy consistency which accents the poblanos wonderfully. We sauteed our peppers and onions until browned and caramelized to perfection! The last and final step was to grill our shrimp. We tossed our shrimp with cumin, cilantro, garlic and lime juice which gave our shrimp a delicious Mexican flair. As you can see this is a super simple dinner to put together and comes together in no time at all! This is a quick and easy weeknight meal you can feel good about feeding your family! That looks so good it might just be my dinner tonight! Thanks Jennifer! Let us know if you try them! Looks very tasty! I found you at Grow Your Blog - Blog Hop. Your guys blog is AWESOME! I'm excited to follow along and learn some new recipes and exercises!